Many machine shops that do performance work build engines for all kinds of markets, from street performance and drag racing to off-road, road race and dirt and asphalt track. But some say the best way to build your business is to focus on a particular niche rather than trying to be all thing to all customers. Building engines for sprint cars and late-model stock cars is a good niche to be in if your local tracks have a strong racing program that is attracting significant numbers of racers and fans. It takes both to maintain a healthy market and a steady demand for engine work. According to the National Speedway Directory, there are about 900 oval tracks in the U.S., with nearly 700 being dirt tracks and the rest being asphalt tracks. Track lengths vary from short 1/8-, 1/4- and 1/3- mile ovals, to longer 1/2-mile and 1 mile venues. The highest profile events are obviously the various NASCAR series races, but dirt tracks are usually where most of the local action is. A weekend racer can usually find a good, used, late-model stock car or modified for $5,000 to $15,000 with an engine that doesn’t cost a fortune to rebuild. Or he can buy a race car without an engine and have you build him whatever he wants. Just as with any type of racing, oval rules define the modifications that are allowed within each class. Rules may vary between different sanctioning bodies, so be sure you’re up to speed on what you can do. In addition, don’t make the mistake of assuming that dirt engines will be cheaper to build than asphalt. While it’s true that traction and wheel spin will limit how much power the wheels can actually apply to the track, surface condition, track length, race length and even driver comfort will dictate compression ratio, stroke, horsepower and torque requirements. It’s a great opportunity to build exactly what your customer needs. 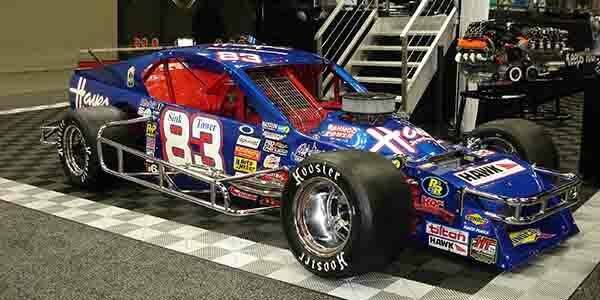 Small block Chevys are the most popular engines in the stock, modified, outlaw and super modified classes. Big block Chevys are allowed in some West Coast super modified events. You’ll also find Ford and Chrysler engines in some late-model stock classes, import engines in sport modified cars, and even spec-built 1250cc Yamaha motorcycle engines in 5/8-scale Legend cars and Dwarf cars (scale replicas of vintage race cars). There are numerous sanctioning bodies that make up the rules for each class of race car and event, so the first step in getting into this market is to find out who makes the rules for your local tracks, and what those rules are. Depending on the class, the rules may define maximum engine displacement, the type of blocks, cranks, heads, pistons and carburetors are allowed, and other restrictions on what you can and can’t do. For a typical dirt modified class, you are probably going to build an engine that makes 400 to 550 hp, has a wet sump oil system and burns race gas or methanol (depending on the rules). Some tracks also limit certain classes of cars to spec crate engines to level the playing field somewhat to driver skill and how the suspension is set up. A crate engine may not generate any machine work initially when it goes into a race car, but if the rules allow the engine to be freshened up as needed after a period of time it may generate some work down the road. The most profitable niche in the oval track world (besides the few guys who build the engines for top NASCAR teams), is sprint cars. The rules in sprint car classes allow a lot more leeway as far as modifications are concerned. Most of these engines are small block Chevy-based with aluminum blocks, and are limited to 410 or 360 cubic inches. These are serious race engines that are capable of making over 900 horsepower and rev to 9000 rpm. They usually have a dry sump oil system, constant flow mechanical fuel injection system and burn methanol. Engine computers are not allowed. Better yet, most sprint car teams will have a number of engines, each of which may cost $30,000 to $50,000 or more depending on the displacement and power level – and the engines will usually have to be rebuilt every 15 to 20 shows. So how do you establish a name for yourself in the local sprint and stock car racing scene? Most of those who specialize in building these kinds of engines have been doing it a long time and have years of experience. They also have a loyal following of satisfied racers. Reputation is everything in this business, and if you succeed in building good engines that are capable of winning races and don’t blow up, your business will grow. If you have been rebuilding anything that comes in the door (which many shops have had to do to survive), but you want to steer your efforts more toward performance work (because it has the potential to be much more profitable) you have to start with your local market. Visit your local tracks. Get into the pit area and talk to the racers and their crews. Find out who’s doing their engine work now and what kind of experience they have had (good or bad). If everybody is using the same shop or couple of shops and you don’t hear any complaints, you really have your work cut out for you. But if you hear some grumbling about reliability, how long it takes to get something done, that some of the engine work they’ve had done wasn’t necessarily up to what they expected, or that they have some major issues with a particular shop, there could be room for some new competition in your local market. The quality of the work that a shop turns out depends to a large extend on the quality and reliability of the people who work in that shop. The shop owner may be a great guy who knows everything there is to know about build race motors. But if somebody in the shop is making mistakes or not doing their job as well as they should, it can lead to problems, engine failures and unhappy customers. This includes everybody from the person who disassembles and cleans the motors to the machinists who do the machine work, to whomever does the final assembly, break-in and tuning. If anybody screws up at any step in the process, it can impact the quality and reliability of the finished product. With the high end racers and big buck engines, there’s no margin for error. The basics of building a performance engine for a sprint car or late-model stock car is similar to that of building any performance engine. You need a good solid block that is dimensionally correct, free from cracks and up to the task at hand. Depending on the RPM and power level of the engine, you’ll need a strong crank (forged unless the rules only allow stock cast cranks), premium race bearings (tri-metal are good for dirt tracks because of their embeddability), a good set of rods (stock or performance depending what the rules allow), a good set of pistons (rules may only allow flat top pistons) and a new high flow oil pump to ensure a steady supply of oil to the rod and main bearings. An engine that has piston oilers or supplemental oil feed lines for the rocker arms and valve springs will require more flow and a higher volume oil pump. Another “must” for oval racing is a well-engineered oil pan with baffles and side kickouts that keep the oil where it belongs and prevents the oil pump pickup from sucking air. With all internal engine parts, stick with well-known, race-proven brand name components. Taking a chance on no-name bargain priced components that won’t hold up in a race environment will do nothing for your reputation. Head options and modifications are often rule limited, as are valvetrains. But within the rules, there may be some leeway as to what you can do to ensure your customer gets the most bang for his or her buck. Regardless of the type of cam and valvetrain, always use the best valve springs money can buy because the springs are typically the weakest component, followed by the pushrods (larger diameter, thicker wall pushrods are best if allowed). Some people swear that cryogenically treated valve springs, pushrods and rockers will hold up better than untreated ones. Bearing clearances will depend somewhat on customer preferences, the type of bearings used and oil viscosity. Some racers like to keep things loose (especially on dirt tracks) and use a heavy racing oil (20W-50, or straight 50 or 60), while others like somewhat tighter clearances so they can use a lower viscosity oil (10W-50). Bearing clearances and oil viscosity have to match, otherwise an engine will have oil pressure and lubrication problems. Too much oil clearance can cause a dangerous drop in oil pressure, noise and a hammering-effect that can pound the bearings to death. Not enough clearance may prevent adequate oil flow through the bearings to keep them cool and to develop a normal oil film between the bearing and crank journal. It goes without saying that bearing clearances should always be measured. Never assume everything is correct out of the box, and that the crank journals have been machined to the correct size. A mismatch here can cause big problems! Many tri-metal race bearings have a thinner babbitt layer than those designed for street stock motors. This allows the bearing to handle higher loads. A thinner babbitt layer will shorten bearing life somewhat, but with a race motor it isn’t quite as important because the bearings will likely be replaced every year or two. Polymer-coated bearings and piston skirts are something else to consider for dirt track racing. A coating provides an extra layer of protection several ways. First, coated bearings will be less apt to overheat, seize and spin or snap a rod if the engine loses oil pressure during a race. The coating by itself can’t provide long term lubrication with no oil pressure, but it may provide enough lubricity to save the engine if the driver is paying attention and sees his oil pressure gauge reading has dropped to zero. The thickness of the coating on the bearings also adds some additional embeddability to handle dirt that gets into the crankcase. On pistons, coating the skirts will reduce the risk of the pistons scuffing if the block overheats because of a water leak or a dirt clogged radiator. Are coated bearings for a dirt track engine worth the cost? Ask any racer who’s seen their oil pressure gauge drop to zero during a heat or a feature event. The extra layer of protection provided by coated bearings and pistons can often save an engine that would otherwise be toast. As for connecting rods, rules may only allow stock rods in certain classes. If any type of rod can be used, your options are powder metal rods (like those in GM LS and LTI engines), forged steel or billet rods, or in the case of a sprint car engine maybe aluminum or titanium rods. Most race rods for oval track engines are made of forged or billet steel such as 4140, 4340, 300M or other special steel alloys. I-Beam rods offer a good combination of light weight and strength for high revving engines. “A-beam” and “X-beam” variants of the basic I-beam design add metal where it is needed to improve strength. The A-beam is wider towards the big end of the rod to add strength, while the X-beam adds a cross brace down the length of the rod shaft to improve rigidity and strength. “H-beam” rods are more commonly used in high torque, high load engines such as supercharged, turbocharged or nitrous boosted drag motors. H-beam rods are typically heavier than I-beam rods, and the wider design increases crankcase windage compared to many I-beam rods. Crankshaft selection may also be rule limited. Some rules require a stock crank or specify a minimum crank weight. Light cranks rev quicker but don’t have the momentum of a heavier crank, which influences how a motor feels going into and coming out of a corner on an oval track. Some drivers prefer a heavier crank while others prefer a lighter crank. If we’re talking a sprint car with no flywheel, the weight of the crank has a much greater impact on how the engine responds when accelerating and decelerating. Sprint cars typically run an ultralight crank with counterweights that have been thinned and profiled to minimize wind resistance. Tuning and throttle response is the key to building winning oval track motors. Unlike drag racing that is pedal-to-the-metal all the way, oval track racers are constantly on and off the throttle. The motor has to have instant and crisp throttle response with no bogging or flat spots. That, in turn, means the lift, duration, lobe separation and overlap of the camshaft have to be closely matched to how the car is geared and the length of the track. Track rules may limit your options as to the type of cam you can use (flat tappet, roller or hydraulic), as well as maximum rocker arm ratio. For the average weekend dirt modified racer, a flat tappet hydraulic cam is often the best choice. It eliminates the need for constant valve lash adjustments, and can deliver just as much power below 6,500 RPM as most solid lifter flat tappet cams. If the rules allow a roller cam, go with a roller cam (less friction and probably an extra 15 hp for the same lift and duration). Shorter tracks require more on and off the throttle, acceleration/deceleration than longer tracks or asphalt tracks that have high speed banked corners. Consequently, you want a cam that’s ground to match the type of track where the car will be raced. For a 355 Chevy that will be running on a short track, you probably want a little more lobe separation, say 108 degrees instead of 106 degrees. On a longer track, you could go with a little less lobe separation. If class rules only allow a two barrel carburetor, choose a cam that has less intake valve duration to maintain good air velocity through the manifold. Ballpark specs for a typical cam ground for a 1/4- to 3/8-mile dirt track car might have a power range of 3,000 to 6,500 RPM, 106 to 108 degrees lobe separation, 250 to 260 degrees of duration (at .050˝ of lift), with a peak valve lift of 0.532 inches for the intake valves and 0.555˝ for the exhaust (with 1.5 rockers). The heads also have to be properly matched to the cam. Rules may limit the type of heads that can be used, as well as port and combustion chamber volumes. Huge ports that flow lots of CFM are great for making high RPM power in a drag motor or a NASCAR Super Speedway motor, but may not deliver good flow velocity or throttle response at lower speeds in a short track oval motor. The trick is to find the right combination of port volume and velocity that delivers the best all-round performance within the RPM power range of the engine. Some drivers want more low end torque and throttle response for coming out of corners strong while others want more top end power for accelerating down the straightaway. The weight of the race car also plays a big role in how responsive the engine is to the driver’s right foot. Sprint cars only weigh about 1,400 lbs., so they respond almost instantly to changes in throttle position and don’t require as much low end torque as a larger, heavier car. It all boils down to putting together the right combination of engine parts that results in a reliable, competitive engine that gives the race car driver the best possible chance of winning at the track. Whether or not a driver actually wins any races with your engine depends on his driving skills, how well his car is set up for the track and luck. But as long as he has a good engine, he can’t blame his engine builder if he fails to take the checkered flag. The fastest way to become a millionaire in racing, of course, is to start with $2 million. Sprint cars are no exception, but a gentleman named French Grimes came up with an affordable alternative called Racesaver. His idea was a smaller engine that could be put together by anyone and raced competitively for a number of years. The formula was simple. Use a GM 305 block with spec heads from Brodix. Flat top pistons, stock rods and wet sump oiling would produce around 450 hp, enough to propel winged sprints well over 100 mph. Motors would be inspected and sealed to keep everyone on a level playing field. Unlike the trend toward “crate” motors, aftermarket parts and services are still needed for this series. That keeps a lot of Americans employed. If you’re a “builder only,” you can work with a local machine shop that can do block machining and then you supply the rest of the labor. I’ve been involved in racing most of my life. My father was a sprint car champion. I started out racing an ASCS 360. I was offered a ride in a Racesaver a few years ago and really enjoy the series. What I want to share with readers is my experience in building one of these motors. Hopefully this will spark more interest in the series and help provide another market for you, the local machine shops and custom engine builder. We’ll be showing how a Racesaver engine can be built and discuss how it may fit into your business model. 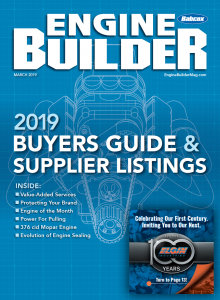 Look for updates at www.enginebuildermag.com as well as in the print issue of this publication over the next several months. I’ll detail the parts I’m using to build this engine and share suggestions about ways that you can use the same or a similar build to develop your own series engine platform.